Arrived back from skiing in Chamonix this afternoon, then hot footed it to see the last night of Orfeo by Claudio Monteverdi at the ADC Theatre. The production was by the Cambridge University Baroque Ensemble & Fitzwilliam Chamber Opera, who have set up this nice web site. The lead playing Orpheus, Sam Furness, and the messenger, Suzana Ograjense, booth stood out with excellent performances. Adam Drew made a good Charon, his bass added a lot of atmosphere as did the makeup! The Ensemble as good, and really impressive when they sang together. The music was wonderful: Dan Tidhar was great on the harpsichord and this pulled the whole piece together. We knew Stephen Mounsey and Anna Langley, playing cornet and lute, but we hadn’t anticipated they would have made such a grand appearance—Anna on stage for the opening scene, and Stephen in the middle isle as part of a grand wind instrument fanfare, from a few rows behind us. I did need a prod half way through the second half: we’d had most of a bottle of shiraz by then and the heat, dark, and wine combined with our early start had me dozing nicely! The appearance of a grand golden Apollo descending from heaven in his chariot amidst a mass of gold and orange sunbeams made quite an impression and blew the cobwebs away (Michael poking me in the sides helped too!). The most impressive staging I thought was the transition from the Styx, to the Palace of Hades. A gauze curtain provided a lit backdrop for Charon that was used to good effect, and the stage behind was lit to show the ensemble, dressed in grey and white gauze shrouds, drifting around on the stage, with Hades and Persephone behind on their thrones. Slick and ‘underwordly’. The ensemble sang behind the gauze screen which added to the atmosphere. Join Orpheus on his perilous journey to Pluto’s realm where he, ravaged by grief, seeks to rescue his beloved wife, Euridice. Accompanied only by Hope and his magical lyre, Orpheus sets out upon a timeless tale of Love so strong it vies to overcome even Death. But will Pluto heed his pleas? Will Orpheus’ own weakness prove his very undoing? As vibrant today as it was in 1607, the world’s first true opera bursts into life on the ADC stage in a brand new English translation. Brought to you by Cambridge’s finest young singers and a large, dazzling period-instrument orchestra, Monteverdi’s music alternately delights and twists at the heart, by turns ethereal and virtuosic. Don’t miss this rare opportunity to witness Orfeo at it’s best – fully staged and spectacular. 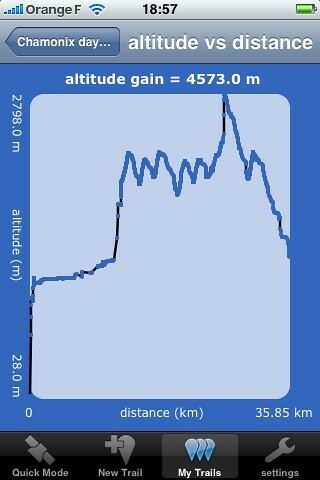 I used the GPS on my phone to plot our morning’s travel, from Chamonix out to the mountain and up and down the slopes. The GPS trail in interesting, but the altitude trail is great and shows how big a descent is possible from this mountain. Salad for lunch at Les Marmottons, at Argentière. Fun service and good, well-priced food. 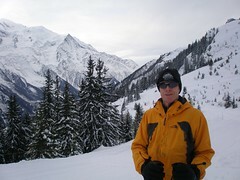 We had rather a long lunch and then headed up for a few more runs, including the Bochard red run. We were starting to feel a bit tired by then, and skiid out in three separate groups, enjoying the Pierre à Ric run while we still had some leg strength Michael and I managed to meet up with Vit and Jay back at Marmottons for a last drink, in the last sun of the day—big beers! More drinks in the evening at the Jekyll, before a fun dinner at Le Boccalatte, where Vit and I shared a brasérade au beouf: a charcoal brazier on the table to roast strips of beef. It smelt (and tasted) great. The restaurant was packed and had a good atmosphere. 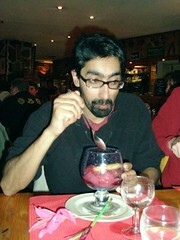 Vit braved a raspberry sorbet with raspberry liquer, that came with a massive plastic flower and straw in it: they were out in a flash! 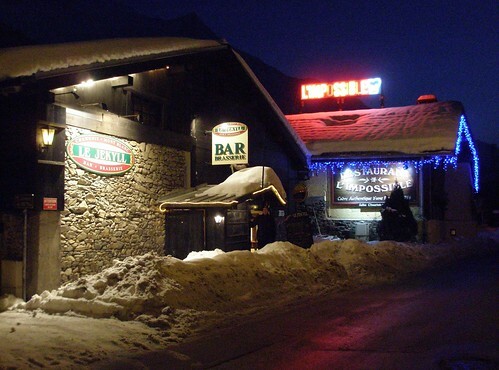 We still had one of the three main resorts left to try (well I did) and so we planned to go to Les Grands Montets. We left half an hour earlier than normal but when we got there, we found that there was a lift strike as part of a national dispute, so we ended up going back to Brévènt where there were some lifts open. 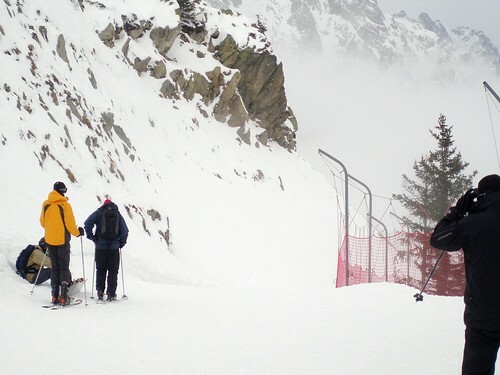 We went back to the Lachenal red run that we enjoyed so much at the beginning of the week, but it was now a much tougher mogul run and it was a bit of a slog! 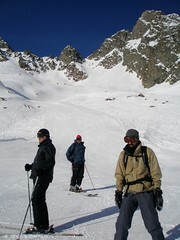 We all made it though, and Michael found it was easier off piste down the side of the run. 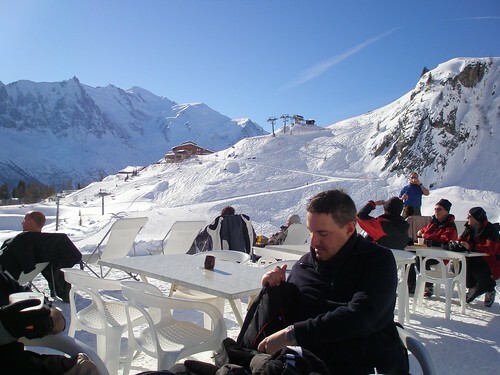 We had great weather, as you can see from the photos and enjoyed stopping for a nice cup of tea—the slopes were pretty quiet and we found a nice outdoor hut. Everyone came around our apartment to drink the Savoie wine that we bought and help eat some of the crisps, bread, cheese and sausage that seemed to have mounted up. We all then shared a cheesy fondue for dinner at Le Monchu. The mushroom fondue was particularly good. 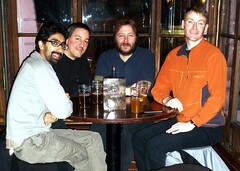 We ended up in a nice ‘local’ bar in the centre of town, Les Bistrot des Sports with a lot of attractive men it (nice!) and drank Affligem. There were icy drafts when the door opened an guys who sort of hung about in the half-open doorway! My knee lasted the day today and I was all rested and ready to go! With some clouds in the sky (gloom) we headed off to Balme because we thought ti would be the least cloudy. When we go there we were lucky, the clouds had lifted at that end of the valley and we had a great day skiing in Balme, encountering only the occasional cloud. 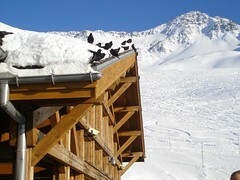 John was harassed at the Charamillion hut by some cunning blackbirds that threw ice from the roof at him in a ploy to get some food. I tried a grog there. not realising it was only rum and hot water – bleurgh! We had a long ski out to Vallorcines down the Esserts Blue Run, and also had great fun on the reds: Solonges and Caisets on the ski out. We had a brief split up: Vit and Michael off to the Chatelet run with an exciting off-piste bowl full of moguls (too much for me), Jay and John went for a long blue Esserts down to Vallorcine, while I went back down the groomed Solonges red, which was very exciting. In the evening, Michael and I went for dinner to Restaurant L’Impossible which was right next door the our local bar, Le Jekyll. The atmosphere and menu were great and we sat in front of a huge fire that belted out the heat at times. I had some escargots, which were smothered in the typical green, garlicy sauce, and Michael had little Savoie toasts with cheese and bacon. Michael fillet steak came out medium-well done, which had to be sent back (and was lovely on take two) I had scallops on a lovely leek and onion fry, which I thought when I ordered had seaweeed, but I wasn’t too sure it did when it arrived. I had Bretan something anyway. We had a few other little things thrown in for a lovely meal. The manager didn’t charge us for Michael steak, which was fair: we did have to eat our mains separately. I had a day in the apartment today, playing Poker Dice and listening to music on my iphone, solving Mensa puzzles that we were given for Christmas and trying to read Gargantua Now (not going well). 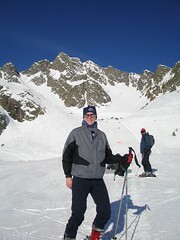 My knee was painful for walking but not when bent in skiing position! Tempting to go out with the others skiing. 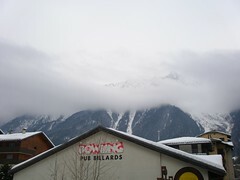 The weather wasn’t great today though: lots of low clouds over the pistes. 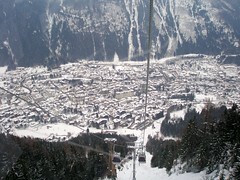 I took the Planpraz Gondola up to Brévènt to meet the others for lunch. They had started the day on Les Grades Montets, but transferred over to Brévènt so they could avoid the cloud. 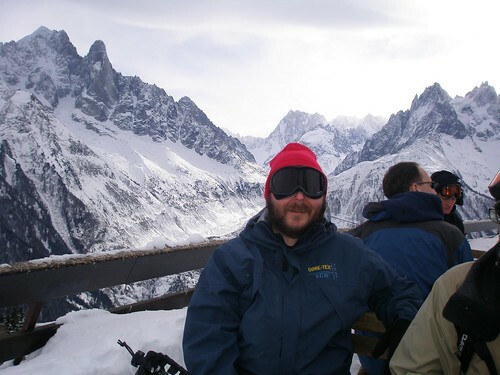 Sadly it was cloudy there, but we all met up for a nice lunch (I had a very heavy Tartiflette that came from a massive wok thing by the door…), and I left the four of them skiing off into the cloud when I took the gondola back down to Chamonix. 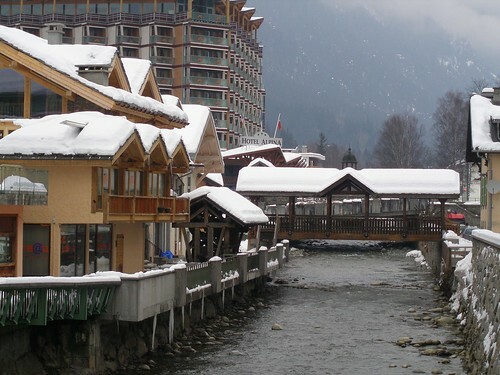 I had a wander around town, ten got a text from MIchael to see he was giving up on the cloud skiing and he joined me for a wander around the shops: with the current parity between the Euro and the Pounds, we didn’t really want to buy anything! 🙁 Stopped for a thé parfumé at Atelier Café, which was nice, and bought a couple of bottles of vin de Savoie to try in the apartment. After drinks at Le Jekyll we met Vit, Jay and John for Happy Hours drinks at Le Jekyll, before heading off for dinner at La Poële Omeletterie, the omelets were of course very nice and we had a good evening. It was a cold evening when we wandered into town. 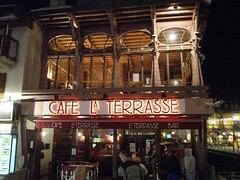 We had drinks at Cafe La Terrasse which is a lovely building inside (strange on the outside). We sat upstairs by the massive single-glazed windows which was pretty chilly. We were thrown out at 11, for a party that was signed on the door as 23:00–23:30! 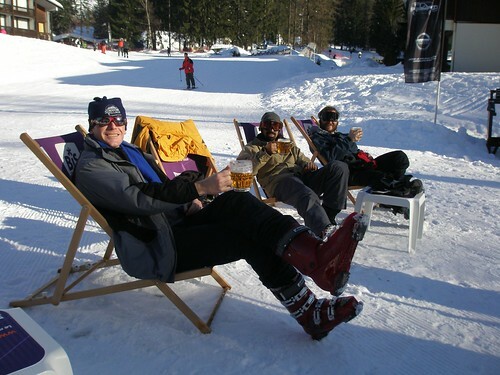 Last night, when I thought about it, I realized that all I’d had to drink when I was skiing was a glass of vin chaud. So it should have been no surprise when I developed a cracking headache. I managed half my seafood pizza (very cheesy) before I had to go back to the apartment, take some ibuprofen and collapse in bed. Must drink more *water* tomorrow! This area covers three mountains or regions easily accessible from Chamonix: Rocher Des Fiz, Aguille Charlanon and Grande Floria. The bus was much more civilized this morning and it took very little time to get up the Planpraz gondola and rhen onto the blue runs from there. 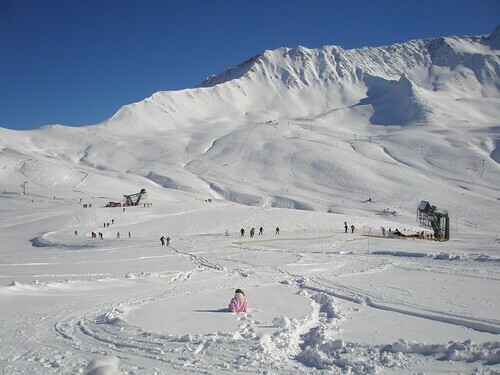 We didn’t spend much time on the part of the mountain and moved across to the Cornu lift and skied the long, wiggly Le Charlanon red run, which was good fun. We took the Liason gondola across to the next mountain for runs off the Index chair lift, getting confused by the mix of runs which seemed to turn into a maze! I fell over rather hard and list both skis on the blue Index piste, on a lumpy bit of snow and also managed to give my knee a good wrench! Ouch! 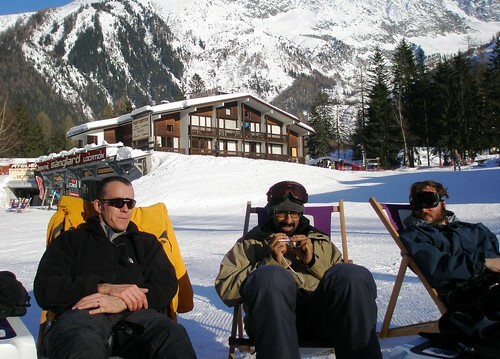 It was still smarting when we had lunch at the bottom of that chair lift, but then not enough to stop me skiing on. After lunch we went down a few fun green runs off the Trappe lift, and I did some nice carving that I was happy with. We then did the best run of the day (we all agreed) that was recommended to me by a couple of guys who I sat next to me on a lift. This is Lachenal, which is a red run that looks scary on the trail map but was a joy: lots of great snow and long stretches of steep that had good contours and made for lots of fun. It was tiring on the legs though. We ended up having a fun planning and trying to get to a café that was really difficult to locate, and redid the blue that I had my crash on (I did it much better this time). Finally made it to the café at Chavanne and had beers to celebrate, before retracing our route, via blue runs, back across the mountains to the chair lift where we started. The light was very flat at times today, which made for some challenging bumps skiing. We all coped well with this though. Back to the apartment and then we had a couple of jugs of beer at The Jekyll before baths and a rest. Wandered into town for dinner in Le Dragon d’Or Chinese restaurant and coincidentally it was Chinese New Year. Celebrated this with a lychee liquer compliments of the house, served in pretty little glasses that had fish-eye bubbles in the bottom that showed pictures of naked women when the glasses were full of liquid: tasteful! The meal was great. Wandered into the town centre for drinks in a lovely bar with an upstairs room fully wood panelled in an Art Deco style. Then wandered back to The Jekyll for some Vin Chaud. My knee is pretty stiff now, as I’m lying bed. Great day. 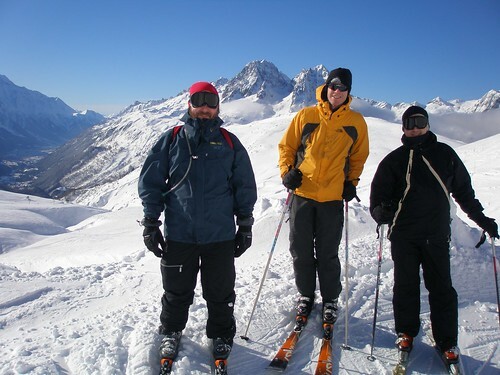 Michael and I met Vital, John and Jay by their hotel and we got the bus from Chamonix Sud to Le Tour to go skiing in the Balme Area. The bus was rammed and it was quite unpleasant long journey in full ski gear. 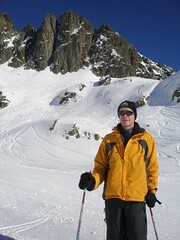 The skiing on the Domaine de Balme (2270m) was great. 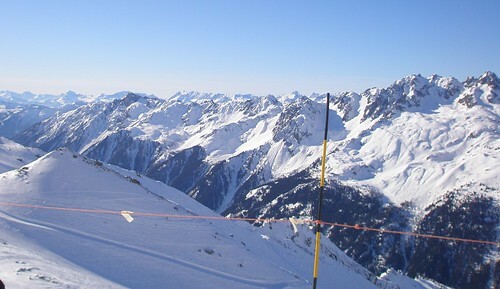 Some groomed peaks and lots of off-piste skiing. We skiid on the Arve and Col runs, and then on the red Ecuries run. Made a couple of traverses across the Liason Balme to get to the Tête de Balme. 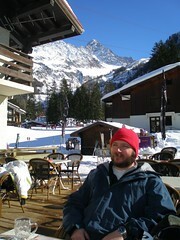 Lunch at the restaurant on Aiguillette, where we had to have a table outside because the restaurant was tiny! We all had lots of cheese on our lunches and some if us had vin chaude. Skiid the Retour Charamillion to get back onto the Autannes Chair lift and the did a few runs around this. Finally about 3.30 we skiid out on Caisets to get back to Tour. It was a very fast run down. We all had a great day, each of us had tumbles! Vit was run off a path by a skier. 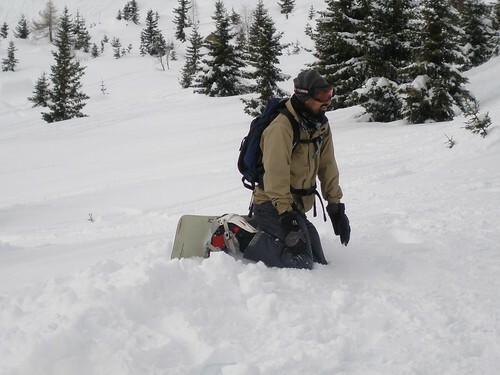 I had trouble in the deep powder off piste: at one stage I recovered from a fall but fell flat on my face again immediately because I hadn’t noticed when I skiid off that I had a ski missing! Relaxing in the apartment now after a lovely bath and the hills are all lit by the evening sun. 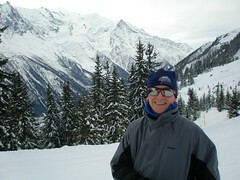 Heading off to France for a weeks skiing, very excited. The snow forecast is great, with more to come too. Apparently there us lots of snow at Geneva, hence the delay to our flight.